Idil Eser, the Director of Amnesty International Turkey, and 9 other activists–known as the Istanbul 10, were a case in the 2017 Write for Rights. They were arrested in Turkey on July 5th, 2017 while Amnesty International Turkey’s Chair, Taner Kılıç, was arrested a month earlier. They are all now free. "It's not just freedom for myself and my family. It will be for all Vietnamese." On October 17th, 2018 Me Nam (Mother Mushroom) was released from prison in Vietnam. Her case was in this year’s Write for Rights! Nguyen Ngoc Nhu Quynh, also known by her blogging pseudonym, Me Nam (Mother Mushroom) was arrested on 10 October 2016 and held incommunicado until 20 June 2017. On 29 June 2017, she was handed a ten-year prison sentence, having been convicted of “conducting propaganda against the State of the Socialist Republic of Vietnam” under Article 88 of Viet Nam’s Penal Code. Taner Kılıç is the chair of Amnesty International Turkey and was arrested in Turkey in 2017. He spent over a year in prison for his peaceful human rights activism. He is now free and reunited with his family. Teodora Vasquez hugs her family and friends shortly after being released from the women’s Readaptation Center, in Ilopango, El Salvador on February 15, 2018, where she was serving a sentence since 2008, handed down under draconian anti-abortion laws after suffering a miscarriage. Mahadine, an online activist in Chad, was released on April 5th, 2018 after spending more than 18 months in prison on fabricated charges. He had been facing a life sentence for a Facebook post critical of the government. Muhammad Bekzhanov, a journalist in Uzbekistan, languished in jail for 17 long years until his release in 2017. His prison sentence was handed down after an unfair trial and severe torture, and arbitrarily extended by the authorities for Bekzhanov’s political activism. At the time of his release, Bekzhanov was one of the world’s longest prison-held journalists. Phyoe Phyoe Aung is a human rights defender and Secretary General of one of Myanmar’s largest student unions. On March 10, 2015, she and 50 other students were arrested by police for their peaceful demonstrations against an education law they believe limits freedom of education. Phyoe Phyoe Aung faced up to nine years’ imprisonment and was a prisoner of conscience. She was freed on April 8, 2016. In July 2012, Yecenia Armenta was taken into police custody in Mexico and brutally tortured. The police beat her for hours, raped her and threatened to kill her children. In spite of independent medical evidence that torture took place, the ‘confession’ was used to charge Yecenia with no proof at all. She was released in 2016. On his 69th birthday, February 19, 2016, he walked free – 44 years after he was first put into solitary confinement in Louisiana. He was the USA’s longest serving prisoner held in isolation. Nearly every day for more than half of his life, Albert Woodfox woke up in a cell the size of a parking space, surrounded by concrete and steel.For the first time in more than four decades, Albert Woodfox is now able to walk outside and look up into the sky. Moses Akatugba was sixteen years old when he was arrested under suspicion of armed robbery in 2005. Moses spent more than three months in police detention, where he says that police officers repeatedly beat him with machetes and batons.Moses was forced to sign two pre-written confessions, and was sentenced to death in 2013. He was released in 2015. Yorm Bopha is a Cambodian housing rights activist, previously imprisoned for defending her community’s rights at the former Boeung Kak Lake in the capital Phnom Penh, where thousands of people had been forcibly evicted since 2007. 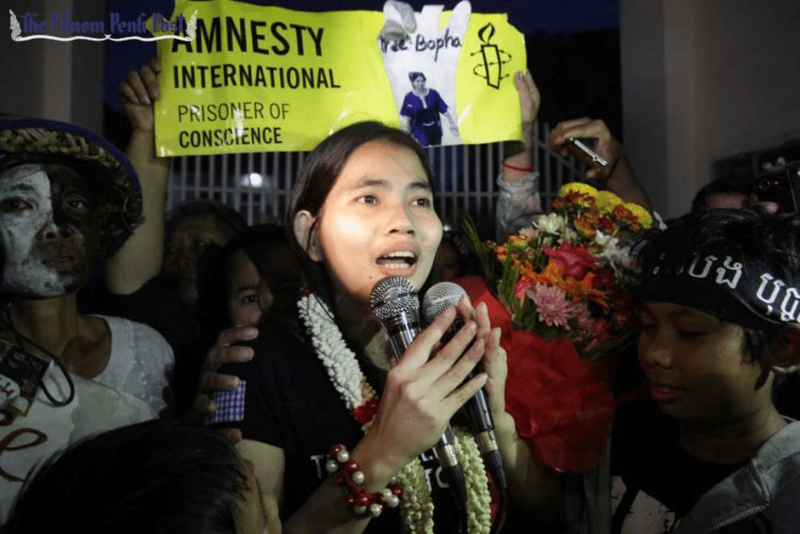 Yorm Bopha’s case was featured in Write for Rights 2013, and she was released the same year.